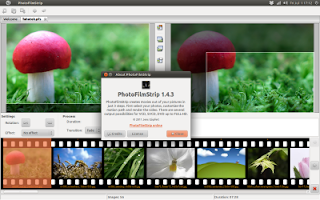 PhotoFilmStrip is an application which allows us to create movies out of our pictures in just 3 easy steps. Just select the photos, customize motion path, render the video, and PhotoFilmStrip will do the rest. PhotoFilmStrip can produce several video outputs for VCD, SVCD, DVD up to FULL-HD. The user interface is kept simple, to let the user do the important things - customizing the slideshow. On the left hand side the user can set the motion start point. The motion end point can set up on the right hand side. In the center you can see tool buttons that gives acces to convenience functions to customize the motion path. In the lower area are listed all used pictures in a real filmstrip. This list supports images to be inserted, removed and moved. Above the filmstrip are the settings for the currently selected picture.